State terrorism, as a concept, has largely been operationalised out of terrorism literature. When a state uses violence systematically against unarmed victims, with the purpose of generating fear and communicating a message to a group beyond the immediate victims, this steps outside the bounds of legitimate use of violence. The Islamic Republic of Iran (IRI) has engaged in such acts of violence against the Bahá’í community in that country. In this study, a working model of state terrorism is devised and the following central research question is addressed: do the strategy and tactics utilized by the IRI and/or its proxies against Iranian Bahá’ís constitute state terrorism? This qualitative study adopts a Mixed Approach Design. Eighteen Iranian Bahá’í and non-Bahá’í emigrants were purposively sampled and interviewed. In-depth interview data was triangulated and validated using structured data sources. Data analysis drew on the systematic-combining approach (Dubois & Gadde, 2002) whereby the original theoretical frame weighed against emergent findings. 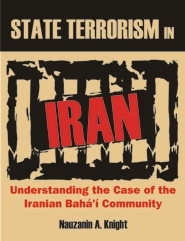 This exploratory study produces empirical evidence to suggest that Iran is a terrorist state: Iranian Bahá’ís are subjected to acts and/or threats of violence stemming from the state or its surrogates; the responsibility to protect norm is not applied to Bahá’ís; and, the IRI tries to invoke fear in and be- yond the Iranian population to isolate and silence Bahá’ís. State terrorism claims many more victims than insurgent terrorism, yet the former concept is seldom mentioned in terrorism studies (Stohl, 2008). The onus is on researchers to identify cases of state terrorists and hold the perpetrators to account at the international level. A special case can be made, based on the empirical evidence, for the creation of an international convention on state terrorism that would hold state governments, like the IRI, responsible for carrying out terroristic acts of violence against segments of their population.